The settlement of Wellington County occurred in many phases and from many directions. The initial immigration had five major centres, or nodes, of colonization. Initially, there were two major routes into Wellington County. 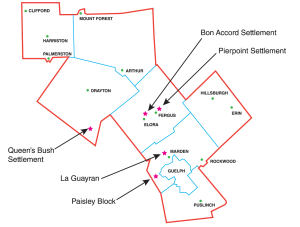 The first was from Dundas to Galt to Pilkington/Nichol/Guelph Townships. The second route was via Oakville to Erin/Eramosa/Garafraxa Townships. In 1828 following completion of the “Old” survey of Puslinch Township, there was a direct route from Dundas to Guelph and travellers no longer had to first journey through Galt. Settlement within the townships generally coincided with the completion of the surveys and allocation of lands. Immigration began on the east side of the county. Early arrivals in Erin, Eramosa, and Garafraxa were predominately Loyalists, or sons and daughters of Loyalists, or served during the War of 1812. Many came from the Niagara and Halton/Oakville regions. The south-west side saw a preponderance of settlers that came directly from England and Wales. Early settlers in Guelph and Fergus were also direct immigrants, mainly from Scotland and other parts of the UK. Researchers should be aware, however, that there were two separate “Scottish” clusters in the Fergus area, Fergus town per se had one but there was also another group of Scots that settled to the North-East of Fergus/Elora. The latter were collectively called the Bon Accord Settlers and they were socially separate from the Fergus Scots. This settlement was located on the east side of Jones’ Base Line as it crossed the Grand River at Fergus. It was a colony of Black Loyalists who had received land grants from the Crown for their service to the King. Richard Pierpoint was the leader of the community. He was born about 1744 in Bondou, Senagal and was a captured slave who was transported to the Americas. He was bought by a British Officer stationed in New York. During the American Revolution slaves were offered freedom if they fought on behalf of the King. Pierpoint was one of the dozen or so Africans who enlisted and fought alongside other Loyalists in the Butler’s Rangers regiments. Following the Revolutionary war, the Black Loyalists received the same land allocation (200 acres) for their service as did all other Loyalists. Pierpoint had received his land allocation near present day St. Catharines. At the outbreak of the War of 1812, Pierpoint proposed organizing a Black unit for service on the Niagara frontier. A unit was formed but it served under a white officer. Richard Pierpoint volunteered with this group (he was over 60 at that time) and saw service during the Battle of Queenston Heights as well as the siege of Fort George. Following the War, Pierpoint petitioned Lieutenant Governor Simcoe for passage to his homeland in Senegal. This request was denied and instead, he along with ten or so other Black families who were either Loyalists or 1812 veterans, were granted additional lands in Garafraxa township. Pierpoint’s settlement duties were completed by 1826 and this was attested 15 September 1826. Pierpoint died in 1838. The community dispersed possibly to Glen Allan area or to Owen Sound. Scottish immigrants purchased the lands from the original Black settlers. Unfortunately, very little about the Black community appears in the early history of Fergus; for years the history of the community only began with the arrival of the Scots. And yet, without the loyalty of men such as Pierpoint, his neighbours, and their comrades in arms, there would not have been an Upper Canada for these Scots to emigrate to. A complete account of the life of Richard Pierpoint is found in: Meyler, D. and Meyler, P. 1999. A Stolen Life: Searching for Richard Pierpoint. Natural Heritage/Natural History Inc., Toronto. One significant group of settlers took up farm lands in 1827. They were Highland Scots known as La Guayrans, a group of over one hundred men, women, and children who had been enticed to settle near Caracas, Venezuela in an area now called La Guaira. The Columbian Agricultural Organization was formed in London in 1825 with the objective of colonizing the Republic of Columbia. Approximately 250 settlers sailed from the Port of Cromarty in the “Planet” in the fall of 1825. Unfortunately, the land and climate was unfit and the attempted settlement was a disaster. After 18 months they were able to be transferred, not home, but to Philadelphia. With the assistance of James Buchanan, British Vice-counsel in New York, an agent for the Canada Company and friend of John Galt, a number were sent to Guelph for resettlement. Through financial support of John Galt (which contributed to his dismissal from the Canada Company since their objective was to sell land, not lease for extended periods), he supported these settlers. They were located north and north-west of present day Marden, three km north of the present City of Guelph. This area was also referred to as the Scotch Block. Due to the ill-treatment on behalf of the Canada Company, a number of these settlers later relocated to other parts of Ontario. The families included McTavish, Gillies, Reid, McFie, Butchart, Campbell, Halliday, McDonald, Stirton, McQuillan, Patterson, Rose, McCrae, Dean, May, Knowles, Daly, Kennedy and Quarrie (Quarry). In 1828 settlers who took up land in the third concession, Division B of Guelph Township became part of the area which became known as the “Paisley Block”, named after the place of origin in Scotland of many of the settlers. Life for these settlers was very difficult, living in a single log barn owned by the Canada Company, and clearing the Huron Road to earn enough money for a down payment on a lot in Guelph or to purchase a fifty-acre bush lot in the country. Among the Paisley Block Pioneer Group were: Archibald McCorkindale, James Laidlaw, Sr., James Elliott, James G. Wright, John I. Laidlaw, William Whitelaw, John J. Hobson, William Dunn, Robert Brydon, Robert Boyd and Thomas Laidlaw. Elora was founded by Capt. William Gilkison who originated from Ayrshire, Scotland. He had served in the Navy and later had command of a fur trading schooner on Lake Erie. In 1832 he purchased the south-west half of Nichol Township, had the town of Elora surveyed by early November 1832, and had the first house built the following month. This was followed by other houses and a store. He died prematurely the following April (23 Apr 1833) in Brantford. The property was divided among his sons. His son David continued the further development of the area, including the establishment of the Bon Accord Settlement. Due to financial issues, the development of the area was slow until the mid 1840’s. Under the influence of Charles Allan the community began a phase of expanded growth. Adam Fergusson was one of the founders of the Highland Society of Scotland. He toured Guelph and other areas of Ontario in 1831 and reported on his travels. His reports, which were published in Scotland, generated much interest among potential immigrants. In 1833 Fergusson brought his family to Upper Canada. He was accompanied by Rev. Patrick Bell and James Webster. Fergusson settled in Niagara Falls area but in early October Fergusson and Webster travelled to the Pilkington/Nichol area based on discussions with Fergusson’s neighbour, Hon. Thomas Clark. They stayed overnight at the new settlement of Elora, travelled upstream a short distance and were impressed with the location. Webster returned to York (Toronto) and Fergusson returned to Niagara to purchase a block of land from Thomas Clark. Webster returned to “Little Falls”, now called Fergus, had a house erected by December 1833 and began the sale of lots and development of the town. Fergusson himself remained in Waterdown. Salem is located on the north edge of Elora. It was established by Sem Wissler, who, unlike the Elora and Fergus founders, was of German descent. His father Jacob was part of the group of German settlers who had come from Switzerland, via Pennsylvania, and settled in Waterloo County. Sem Wissler came to Waterloo County in 1839 and worked with his older brother John. Sem had married a Scottish woman, Jane Robertson, in 1834. One of her uncles, John Keith, was a member of the Bon Accord settlers. During visits to the relatives, Sem Wissler saw the potential of the Irvine river just West of Bon Accord. He and John bought about 160 acres from the Gilkisons in 1844 to establish the village of Salem. The first building was erected in 1845. This was settled by a group of Scots from Aberdeen; the name Bon Accord was derived from the motto on Aberdeen’s Coat-of-Arms. They came over to Upper Canada in five different groups in 1834 and 1835. George Elmslie was sent early on in 1832 to scout potential areas. He and Alexander Watt agreed to situate the settlement in Upper Nichol Township (North-East of Elora, North-West of Fergus). They purchased about 2000 acres and in fall 1834 the first clearing had been made and building erected. The remainder of the settlers departed Aberdeen at various times in 1835 and arrived in Bon Accord that year. The Queen’s Bush Settlement was a community that developed the southern half of Peel Township. This community was composed of Black settlers, many of whom were escaped slaves. By about 1840, there were about 1500 Black settlers in this area with about 1000 White setters. Initially, the focus was clearing land, building shelter, producing food and surviving. In the 1830’s, several American ministers and teachers established schools for the community; most of the community had been kept illiterate by their owners. Education was viewed as an important skill which would contribute to the success of the developing community. By 1840, the community developed into a typical rural community and saw the erection of churches, businesses, and schools. In the 1840’s, land agents began to prepare the Queen’s Bush lands for sale. The Queen’s Bush community was viewed as squatters and had no title to the land or the improvements they had made over the years. Although the Government offered the land (to be paid over a 10-year period) to the residents, it was at a price too high for the community to afford. A major dispersal of the community occurred. Many were forced to abandon their farms and homes that they had worked so long to create. A large number relocated to Owen Sound area. By the early 1850’s the Settlement had essentially disappeared. Bourrie, D. 2008. From Scotland to Upper Canada by way of Venezuela. Families 47(3): 15-18. Brown-Kubisch, L. 2004. The Queen’s Bush settlement: Black pioneers 1939-1865. Natural Heritage/Natural History Inc., Toronto. Connon, J. R. 1974. The early history of Elora and vicinity. Reissued with an introduction by Gerald Noonan. Wilfred Laurier University, Waterloo, ON. Hutchinson, J. F. 1998. The history of Wellington County. Landsborough Printing Ltd., Grand Valley, ON. Wright, G 2002. The Caroline and her Passengers, March – May 1832. Wellington County Branch OGS, Guelph, ON. Wright, W. A. 1932. Pioneer days in Nichol, Including notes and letters referring to the early settlement of the Township of Nichol and its villages. Mount Forest, ON.